What I'd asked for was a nuclear submarine propeller, better known in the Navy as a screw. It is so secret that when a sub comes in from patrol its propeller is shrouded with a large covering, and if a sub is drydocked for any length of time, it is commonly removed and stored away from the ship for servicing and prying eyes. It is what drives a submarine quickly and quietly through the water, and it is absolutely critical to a submarine's stealth. It is an extremely high-tech piece of equipment, resulting from extensive Navy research and development, and until recently our propeller technology exceeded the Soviet Union's by a considerable margin. As a result of this and other factors, Soviet submarines of the Cold War were noisier, and therefore easier to detect than our own. Within the context of national security and defense, as well as our nuclear deterrence policy, it is easy to see why propeller research and design have been so carefully guarded. The propellers of USS Nautilus, the first nuclear submarine, are an exception. Essentially World War II submarine propellers, theyalong with the rest of the subare on display at the Submarine Force Museum in Groton, Connecticut, near where she was built in 1955. But something happened to change all that. Back in the mid-1980s, the Japanese company Toshiba sold propeller milling machinery to the Soviets through the Norwegian Kongsberg firm; this and other submarine intelligence furnished by the Walker spy ring resulted in significantly quieter Soviet subs by the later part of the decade. As writer Neal Stevens wrote about the Akula-class Soviet boats, "The combined results generated a steep drop in broadband acoustic noise profiles." 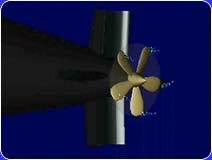 What is so special about submarine propellers? It's really pretty simple when you are lucky enough to have the world's foremost experts explain it in simple terms, and you don't need to be familiar with "tip vortex flowfields." As props turn, the angle of the blade pushes through the water, driving the submarine. Once they reach a certain speed, the blades begin to create a partial vacuum, which results in air bubbles. This is a state known as cavitation. Bubbles are noisy, and submarine propellers are designed and shaped to reduce cavitation and exploit other relevant laws of physics as much as possible and still maintain useful speeds. Of course, balancing all of these factors results in a compromise, and our newest generation of submarines, the Seawolf-class, does not even use propellers. Neither will the future generation, the Virginia-class, still on the computer design screen. Other options offer fewer disadvantages. The boomer USS Georgia (SSBN 729) in drydock, with her propeller shrouded from sight. But what's that peeking out from under the cover at around 9:00? Courtesy of the U.S. Navy. 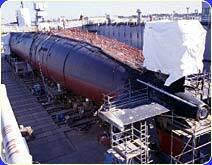 The fast attack submarine USS Jacksonville (SSN 699), in drydock in Norfolk, Virginia in October 1998, showing her propeller removed for servicing and/or replacement. Photo by the author. The propellers from USS Nautilus (SSN 571), the world's first nuclear submarine, are on display outdoors at the Submarine Force Museum in Groton, Connecticut. Much like the prop of a surface ship, it lacks the silencing technology of later screws. Courtesy of the Submarine Force Museum. Spinning propeller showing cavitation bubbles. Courtesy of Sonalysts, Inc.